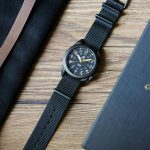 I was on the lookout for a nice dress and casual watch for a while and when I saw this attractive watch I knew I have to get it. Davosa is not a brand that I’ve heard of and I went digging for more info. 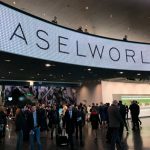 It’s actually a German brand established in 1993 but its roots can be traced back as far as 1861 to a family of farmers and watchmakers in Switzerland. 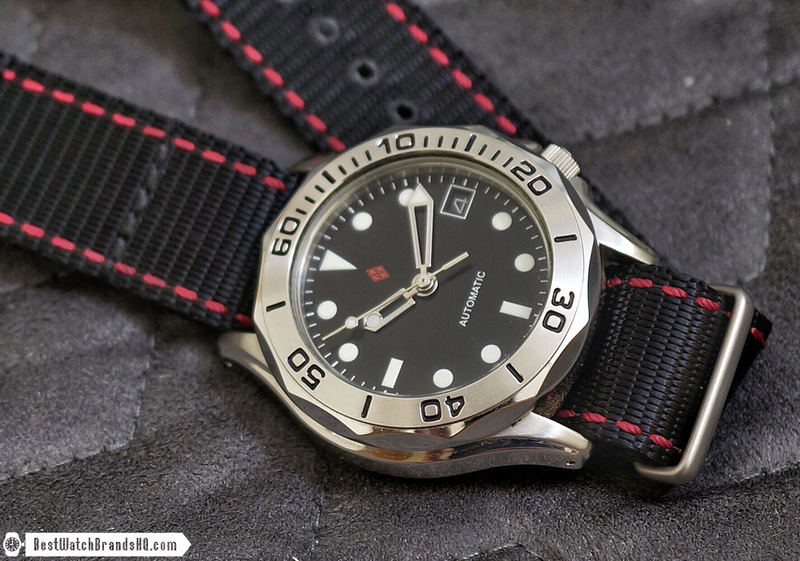 While the company is German, but the watches are Swiss made. 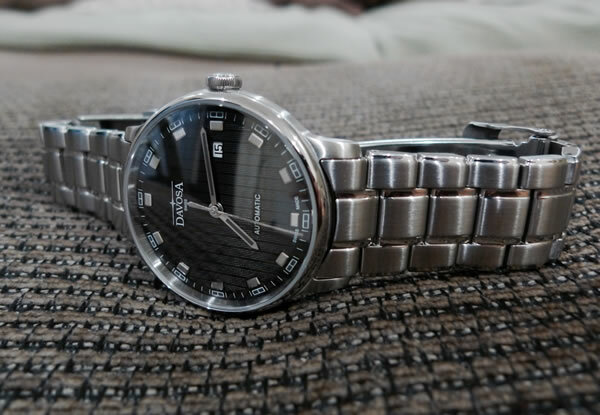 The watch that caught my attention was the Davosa Vanguard. I made the order online and a week later arrived much to my anticipation. When I opened the huge box, the Vanguard was ticking away happily ready to please me for the rest of the day. I must say the watch looks even better in person than the pictures online. What immediately caught my attention was the unique design of the dial. It also comes with 3 straps and a strap tool to remove both the buckle and spring bars. The case itself is very attractive at 40mm which is on the big side for a dress watch but it’s built into a very compact design. So it actually wears smaller than it is because of the short lugs. This is important for me as I have a small wrist measuring just 6.1 inches and most dress watches at 40mm will look awkward on my wrist. It’s also remarkably thin at 9.5mm including the domed sapphire crystal. 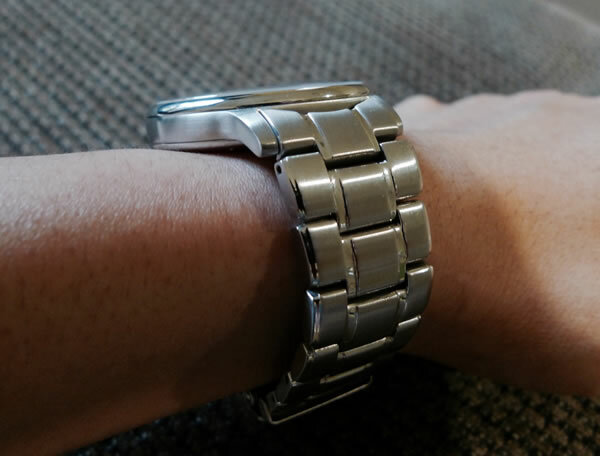 The lug to lug distance is 45.8mm and the lugs does not extend too much over my wrist which makes the watch fit just fine. The case has a polished thin bezel while the central part which is the side of the case is brushed. That gives it a very handsome and masculine look which I like. I’m not a great fan of overly polished cases as it kinda limits the use to only dressy and formal occasions and not to mention attracting scratches. The domed sapphire crystal tends to attract a lot of reflections and it stands out from far telling people that you’re wearing a nice watch but not a flashy shouting kinda way. The crown is onion shaped and complements the vintage design of the case. The Davosa star logo is etched on it and the crown though is thin gives you enough grip for you to wind it. It also has a see-through case back showing the innards of the ETA 2892-2 automatic movement for those watch enthusiasts who love to see how it is working every second. The dial itself is what makes the watch unique. 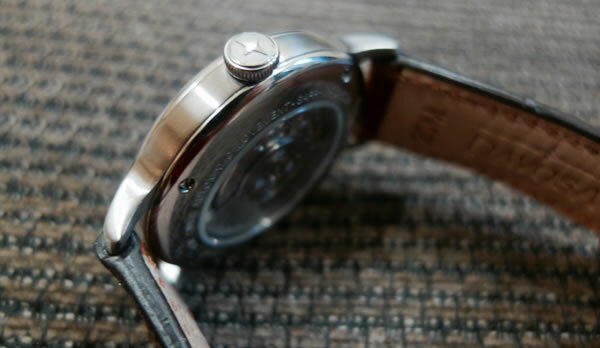 The surface of the dial features a pinstripe pattern that is not obvious at first glance and from a distance. From far it looks just like a normal black faced watch. When looked closely, you will appreciate the little details on the dial where the pinstripes gives a 3D effect where at certain angles against the light, you will see it more obviously. Around the inner dial at every hour there’s a large block of brushed steel with polished beveled edges. Again I prefer this look as it’s not too flashy when light hits them. It tends to blend in nicely with the pinstripes. On the edge of the dial, there’s white lines for the minutes and seconds and every 5 minutes there is a twin rectangle block of what appears to be black lume. It completes the unique look of the brushed steel blocks. The twin blocks on the minute markers does make it harder to tell the 1st and 4th minute of every 5 minute interval line but that seems to make it a little bit more unique. 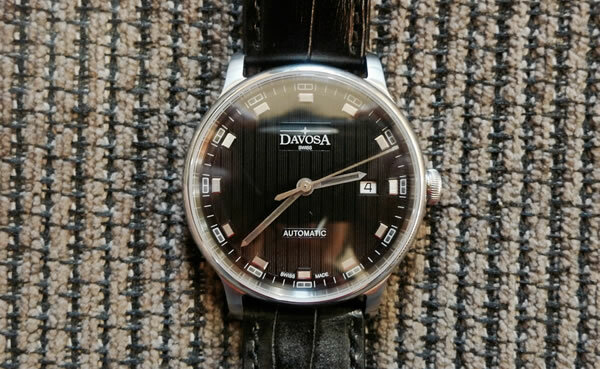 The Davosa logo makes just the right presence and the black on white date is at 3 o’clock position. At first I thought the hour and minute hands have a hollow transparent look but it’s actually filled with black Super-LumiNova lume. The hands are simple and elegant looking and the black lume just enhances the uniqueness of the watch. However I’m a lume guy, this is where black Super-LumiNova fails miserably in its duty to light up in the dark. I did a test and charged it up. When fully charged, it’s a faint glow and after just 10 minutes it’s completely dark. So the black Super-LumiNova is just for design purposes and doesn’t do much at all. 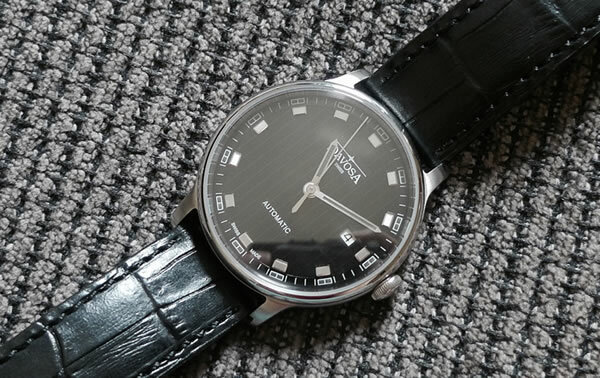 However the Davosa Vanguard is also offered in a white dial variation where the lume is white. That could be much more lasting. 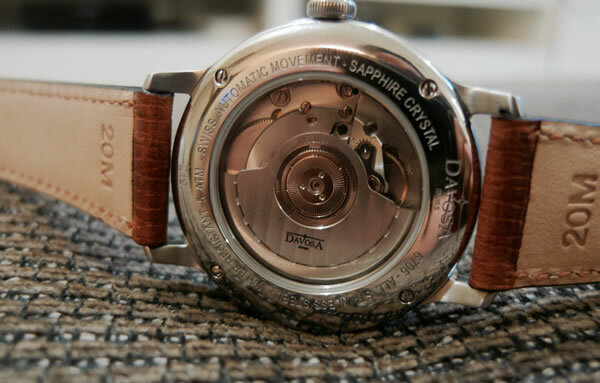 The Davosa Vanguard has a Swiss ETA 2892-2 movement inside and from what I have read is a very reliable movement found on more expensive models. It’s basically a 2824-2 movement but thinner and somewhat more shock resistant. It has 21 jewels, 42 hour power reserve and a frequency of 28,800 bph. I have tested its accuracy and found it to be incredibly accurate where it’s varying around +/- 1 second per day. 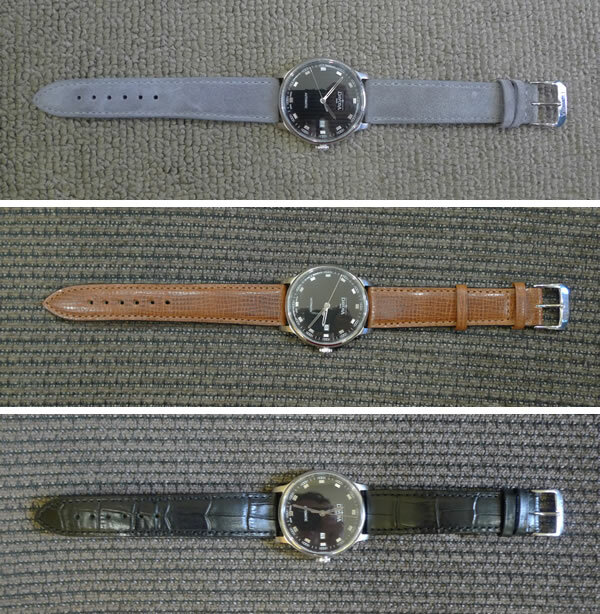 I’m a strap guy and have many extra straps to interchange with a watch that you’re bored with and it makes it feel like a brand new watch again. So it’s a good thing that Davosa gives you 3 leather straps of different colors to play with. One of it is the honey brown leather which is my favorite and it has very unique texture and grain to it. 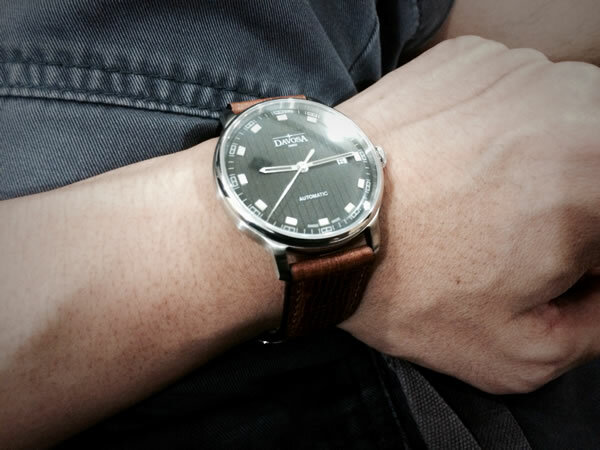 When paired with the watch, it gives the watch extra elegance and is casual enough to wear with jeans as well. The second strap which is also my second choice is the black satin sheen leather. This is the strap you need when you go to formal dressier occasions and is good to have. The last strap is a light grey nubuck leather which is soft to touch. I didn’t really like this color as it tends to make the watch feel a bit more feminine. If it were to be a darker grey color would’ve made it a bit more rugged. The strap measures 80mm on the buckle side and 115mm on the other. The problem out of the box was that the straps only had 6 holes and with my wrist being smaller at 6.1 inches, it wears kinda loose. So I ordered a strap hole puncher and made a 7th hole and it then fits much better. One thing about the straps when I was looking to purchase it online was that the colors you receive may be different. Apparently there’s more than the 3 colors I mentioned offered. I know that there’s also a dark brown leather strap. So you may get a different set, but you can check with them just to be sure. 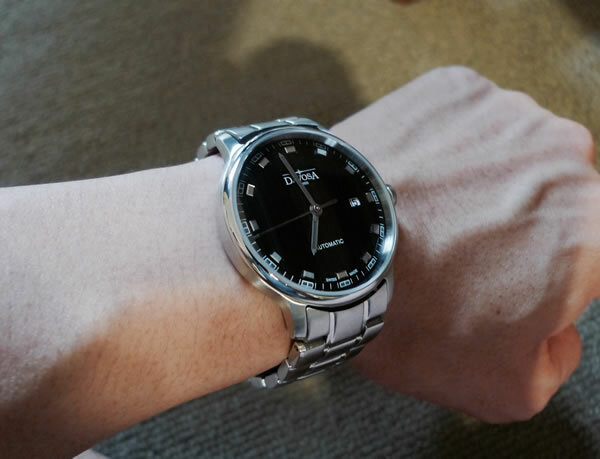 I was curious how it did look on a stainless steel strap. I took one of my Citizen 20mm steel strap and put it on the Vanguard and it definitely made it look really classy. Check them out here. 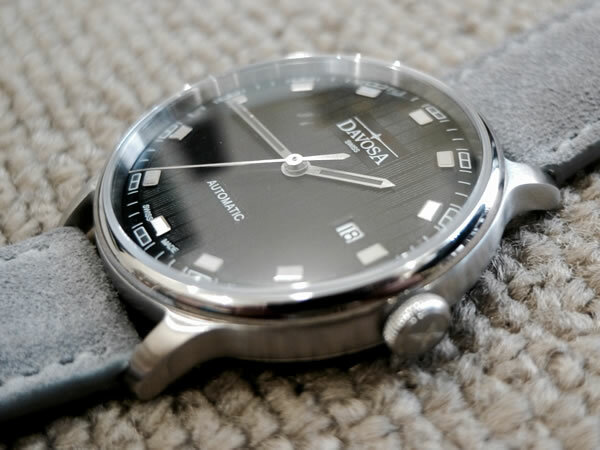 Davosa Vanguard is a great watch that really appeals with its uniqueness and quality. I tend to favor the lesser known brands and the name Davosa sort of sounded nice as well. The great vintage and contemporary look means you can wear it for casual and formal occasions. 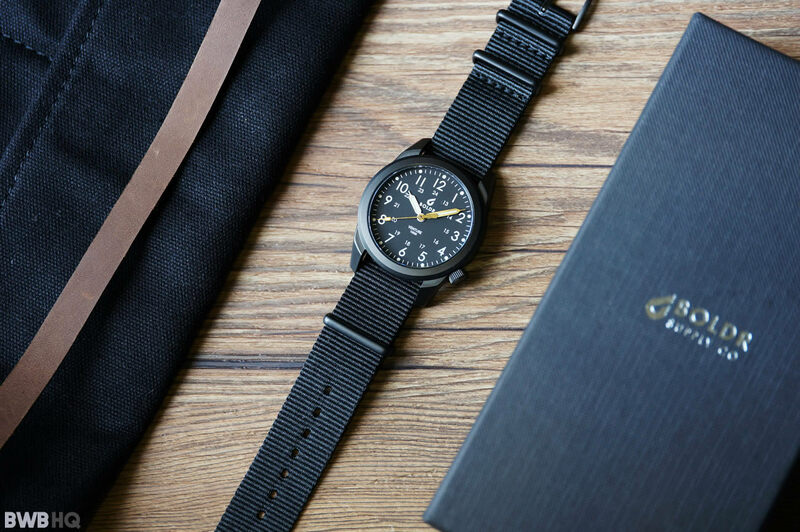 Competitively priced, it’s sort of good value considering you are getting a good reliable movement, sapphire crystal, a well made case and comes with 3 different straps. The model number for the black dial version is 161.513.55 while the white dial version is 161.513.15 and it retails for around $819.